Sand Castle II Penthouse #2 is a 3 bedroom beach front condo vacation rentals on Sand Castle II Indian Shores Beach that can be rented Saturday to Saturday through this page. Vacation Rentals Indian Shores are the cleanest and most updated, since they are managed directly by the owner, someone who really cares. Please call me, the owner if you have any questions about my Indian Shores Beach Rentals. Indian Shores is between Clearwater Beach and St. Petersburg. Tommy Bahama style, three bedroom, two bath, vacation, penthouse condominium. It directly overlooks the glistening Gulf of Mexico and sparkling white, sandy beach of Indian Shores. The penthouse was professionally redecorated and upgraded. 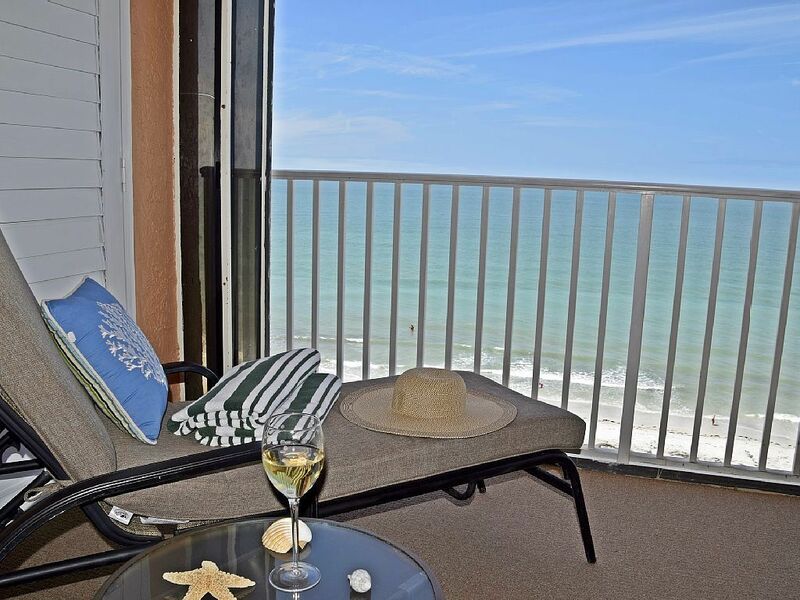 The penthouse is located on the top, tenth floor of the popular Sand Castle II Condominiums. The master bedroom and living room share an extra-large balcony directly overlooking the beach with breathtaking panoramic views, perfect for enjoying our brilliant sunsets. The quiet, wide beach offers sparkling, white sand loaded with undiscovered seashells and relaxing cabanas. The heated swimming pool and whirlpool/spa stays warm all year long. There are two barbecue grills and a charcoal grill with tables for pool-side fun. Over-size beach front balcony seats up to nine for entertaining and breathtaking views. Master bedroom has brand-new, tropical island-style furniture with luxurious king-size bed, en suite bathroom, ceiling fan, opens to beachfront balcony. Second bedroom has two plush queen size beds with TV/DVD with panoramic views of intercoastal waterways. Third bedroom has new furniture with two twin size beds and TV/DVD also overlooking the intercoastal waterways. Very comfy leather sofa, over-size rattan chairs, and ceiling fan in living room opens to beachfront balcony. There are ceiling fans in all of the bedrooms too! - Over-size beach front balcony has nice furniture for entertaining and breathtaking views. - Free WIFI and very fast too! Sunset Beach Condos is Pam Carpentier and team. As a local, long term Pinellas County resident, I started with one condo, when my kids were little. From there it grew to five 3 bedroom beachfront condos on Madeira Beach and Indian Shores that I own and manage myself. My condos are more like 2nd homes since they are true Vacation Rentals By Owner. With 17+ years of hands on personal experience... I've thought of everything. Each of the condos are deep cleaned for six hours prior to their guests' arrival. They are well decorated and updated with attention to detail. Lots of extras are provided. I attend to them every Saturday since I truly love what I do and it shows. We have been doing this since 2001 and know what it takes to provide you with what you need and even go beyond your expectations. Our goal is to provide you with your most memorable vacation experience that you will look back upon for many years with great fondness. One reserved spot with plenty of guest parking. Lots of beach toys and chairs in the balcony closet.